Improve your music, inform your marketing, and understand your audience through with unbiased feedback from real music fans. Built by ReverbNation, powered by Audiokite. After years of providing best-in-class research services to musicians, labels, and music companies, Audiokite was acquired by ReverbNation in March 2016. Since then, ReverbNation has incorporated Audiokite's technology into its revamped Crowd Review. 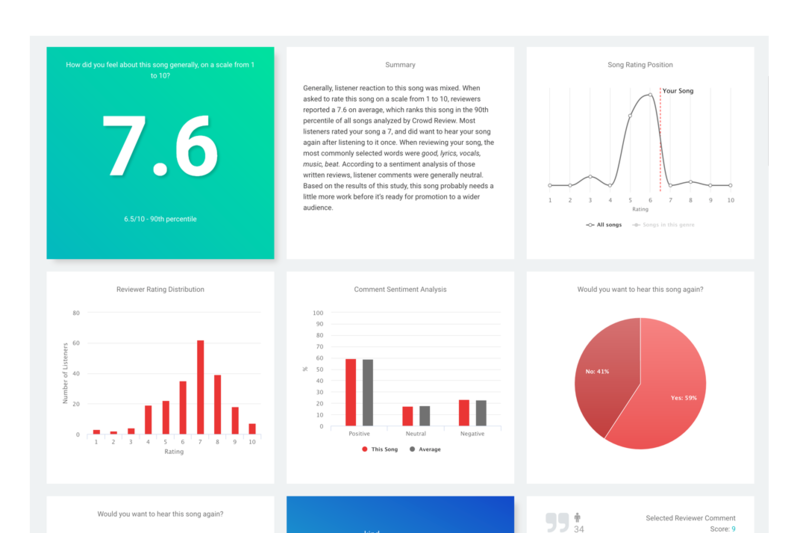 Now, you can customize your research report in the areas most important to you with brand new Advanced Insights like Songwriting Analysis, Production Quality, Audience Identification, and Commercial Potential.